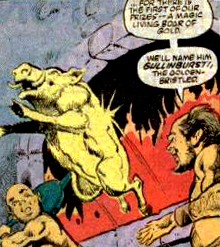 Aliases: "The Golden-Bristled," "Golden Tusk"
Powers/Abilities: Gullinbursti can plow the earth with his tusks and speed across earth, sea and sky faster than any bird or horse. 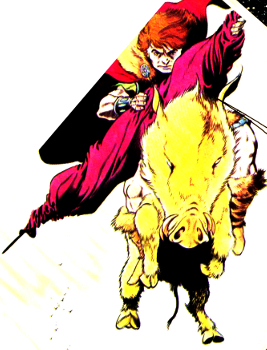 Frey or other gods could ride Gullinbursti or hitch him to a chariot. Gullinbursti's golden bristles shed light even in the darkest gloom. This light can dispel illusions (at least those of the trolls) and can painfully drive off light-sensitive beings such as trolls. (mythology/Thor Annual#11 (fb)) - Gullinbursti ("Golden Bristles") was fashioned by the dwarves Brokk and Eitri as one of three gifts they presented to Odin to surpass that of his spear Gugnir. Despite the efforts to distract Brokk via tickling in the form of a butterfly, Gullinbursti leapt from their hearth as they crafted it, and they had to leash it to hold it down. They gave it to Odin along with the gold armband Draupnir, and the hammer Mjolnir. 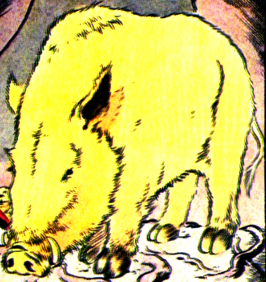 Odin vowed to hold the golden boar in trust for all the gods. (mythology) - Gullinbursti was given to Frey to pull his chariot. (Marvel Graphic Novel No. 15: The Raven Banner (fb) - BTS) - To aid Greyval Grimson in his quest to recover the Raven Banner (which had been stolen by trolls while Greyval was shirking his responsibilities), Odin dispatched Gullinbursti to the caverns of the Norns, below Yggdrasil. (Marvel Graphic Novel No. 15: The Raven Banner ) - After Greyval chose the Norn's option of rescuing his bride, Sygnet, who had been captured by the trolls, they sent Greyval to Gullinbursti. With his ally Oddbrand Otter, Greyval climbed atop Gullinbursti, who flew them to the kingdom of the trolls where they found the storm giant Snorth guarding the cave in which Sygnet was being held. Gullinbursti swooped down for Greyval to clash swords with Snorth, then, while dodging boulders hurled by trolls, brought Greyval in for another strike, in which Greyval decapitated Snorth. After the trolls fled, Gullinbursti waited as Greyval rescued Sygnet. Gullinbursti then brought Greyval to the Abyss of Shadows where the Banner was held. As they landed amidst the troll's cave, Gullinbursti's radiance dispelled the cave's illusions and painfully drove off the trolls present. Greyval charged Gullinbursti with keeping the trolls at bay until he called for the boar. Greyval slew his ensorcelled cousin, Horskuld, and recovered the banner, then called to Gullinbursti, who flew down and carried Horsuld to Asgard. Greyval's arrival and possession of the Banner assured Asgard's victory, but at the cost of Greyval's life, as the Banner's nature ensured. Gullinbursti stood by the fallen Greyval as Sygnet approached her fallen husband. Comments: Created by unidentified people as part of the Asgardian myth/legend. adapted by Alan Zelenetz, Bob Hall, and Vince Colletta. I'm not sure how or why Gullinbursti's information was merged into the profile on Gullin the Boar God, as was the case for several years on the Appendix. Gullin was most likely inspired by Gullinbursti, but they are pretty clearly different beings...and both appeared in the Raven Banner graphic novel...on opposite sides of the conflict! 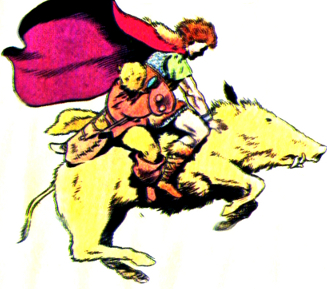 His brother was Hildisvini (Battle Boar). Created by the dwarves Dain and Nabbi for Freia (Freya), he had many of the same attributes of his brother as well as the ability to shine in the dark. Thanks to Marvellous Luke, for his help in cleaning up my scans!